The uninitiated buyer could be forgiven for thinking that an apartment with a price tag of $10 million, $20 million or much more comes fully loaded with amenities. But as prices for ultraluxury condos in Manhattan continue to climb, practically every extra inch in these fancy new buildings — be it in storage units in the basement or in staff quarters on a separate floor — is being sold à la carte for extraordinary sums. Wire-mesh storage cages in the basement of 18 Gramercy Park, where a $42 million duplex penthouse closed last year, are going for $75,000, or $2,143 per square foot, for a 35-square-foot space. Private wine cellars range from $98,500 for 900 bottles to $215,000 for 1,700 bottles at 135 East 79th Street, an Upper East Side prewar revival where an apartment recently went into contract for $26.5 million. Twenty-five staff suites, commonly referred to as “maid’s rooms,” are selling for between $1.53 and $2.875 million at 432 Park Avenue, where a penthouse is in contract for $95 million. And then there are the underground parking spots at 42 Crosby Street in SoHo with price tags of $1 million apiece. Space with no views at the Sterling Mason, a 33-unit condominium at 71 Laight Street in TriBeCa with 24 such areas, costs between $30,000 for a 28-square-foot storage unit (or $1,071 a square foot) to $55,000 for 94 square feet ($585 a square foot). The building’s 12 parking spots — nine of which are now spoken for — cost $275,000 apiece. Uptown at 520 Park Avenue, a 54-story luxury condo tower being built by Zeckendorf Development and its partners Park Sixty and Global Holdings, which recently made headlines for a penthouse triplex priced at $130 million, there are plans for 15 storage units ranging from $55,000 to $95,000 for the 31 apartments. Ten wine cellars will be offered for $125,000 to $275,000. Buyers at 56 Leonard who pay $72,000 for a storage cage will not actually own it, however. As in many new buildings with subterranean space, they are buying long-term licenses for their storage units and parking spots, entitling them to use the space as long as they are residents of the building and requiring that it be sold in the event of a move. In addition to the license fee for the storage area, there is a $19-per-month charge that goes toward utilities and payroll for cleaning and maintenance. Not all that long ago, a visit to a storage bin in a stately co-op building might have involved negotiating a labyrinth with a flashlight and tripping over someone else’s chair. While today’s storage areas may be more organized, they are not much of an upgrade, mostly consisting of wire-mesh cages that come with electricity. Maid’s rooms are essentially glorified studio apartments. And parking spots are, well, parking spots. And in Manhattan, where luxury condominiums have been commanding stratospheric sums, the add-ons are priced in relation to the apartments alongside which they are being sold. “These amenities are essentially proportional in value to the building they’re located in,” said Mr. Miller. With the starting price of $72,000 for the 36-square-foot storage unit at 56 Leonard, for example, the price per square foot comes to $2,000. “That kind of makes sense,” Mr. Miller said, when you consider the apartments there have been selling for as much as $4,000 a square foot. Photo Private wine cellars range from $98,500 for 900 bottles to $215,000 for 1,700 bottles at 135 East 79th Street, a 30-unit Upper East Side apartment building completed earlier this year. Silver travertine stone slab floors line the corridor leading to the wine cellars. And it isn’t just new condos that are getting high prices for amenities. Brokers say the costs of storage and other add-ons have also been going up with high-end co-op resales, although the trend is harder to pinpoint since extras are often wrapped into the overall sales price when these apartments change hands. Resales of condo extras have also been going up. Last September, a staff unit on the seventh floor of 15 Central Park West sold for $4 million, up from $1.8 million in 2011 and slightly above $1 million in 2008. In 2011, two ground-floor units in the building, designed as detached home offices, sold for a combined $3.56 million. Earlier this year, the same combination unit was sold again, this time for $7.15 million. At 432 Park Avenue, demand was so high for staff suites, which are essentially studios located on the 28th and 29th floors, that the developers, CIM Group and Macklowe Properties, are considering adding more to the building, which recently topped out as the tallest condo in the city. At 30 Park Place, Four Seasons Private Residences New York Downtown, so-called “accessory suites” (better known as “maid’s rooms”) start at $1.2 million. There are 11 in all for the 157-unit building. Seven staff units planned for 520 Park Avenue will be called “guest suites” and will be offered for $1.45 million to $1.57 million. One of the few new buildings to offer enough extras, at least in parking, for every apartment is 50 United Nations Plaza, an 88-unit condo designed by Foster and Partners for Zeckendorf Development with Global Holdings. Parking licenses cost $150,000 apiece, plus a monthly fee of $295. The building is also offering 17 wine storage units starting at $50,000 for 24 square feet and 50 storage units starting at $45,000 for 50 square feet. Not every luxury condo is selling these extra spaces separately. At Alchemy Properties’ 35XV at 35 West 15th Street, for example, where available apartments are priced from $3.95 million to $12.65 million, each of the building’s 54 residences comes with a wine cabinet that can accommodate 69 to 300 bottles, depending on the size of the apartment purchased. Brokers encourage clients to buy extras when they have the chance, even if they don’t expect to use them. At the Bullitt Center in Seattle, occupants choose to take its “irresistible staircase” for 75 percent of trips on entering the building rather than opting for the elevator, as compared with the 17 to 23 percent of trips made via stairs in a typical office building, according to results published this year by the Center and lauded by Friedman. While climbing the Bullitt staircase users enjoy panoramic views of Puget Sound and downtown Seattle whereas the elevator is tucked into a back corner of the building and requires a key card to access. “Any engineer can design a staircase to meet code but architects have the design and training to design a stair that beckons use,” Friedman says. The identity of the owner of the largest private house in London has apparently been revealed — he is Russia’s 28th richest man. When Witanhurst, in Highgate, north London, is finished it will be second in size only to Buckingham Palace. Secrecy has surrounded its owner but he has now been named as Andrey Guryev, a fertiliser magnate, who has a fortune of £2.6 billion. The property, which was built about 100 years ago on an 11-acre plot, was sold for £50 million in 2008 to a company registered in the British Virgin Islands, according to New Yorker magazine. It said plans to redevelop the house were approved in 2010, to the consternation of neighbours, and that the new owner had demolished Witanhurst’s service wing, replacing it with the so-called Orangery — a three-storey Georgian villa designed for “everyday family accommodation”. An “underground village” has also been built beneath the property, containing a 70ft swimming pool, cinema, massage rooms, sauna, gym, staff quarters and parking for 25 cars. Earlier this year, the owner also sought planning permission to extend an underground “servants’ passage”. The mansion has 25 bedrooms and a 70ft ballroom. When complete it will provide 90,000 square feet of living space. The article, by Ed Caesar, a British writer, said permission was granted in 2013 for a second basement, and that the house was poised to become the most expensive in London, with an estimated value of £300 million. Although Buckingham Palace is London’s largest home, with 78 bedrooms, it is owned by the institution of the sovereign, not the Queen. 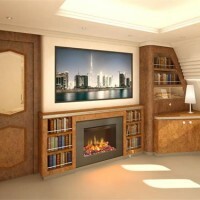 At EBACE 2015 (European Business Aviation Convention & Exhibition) in Geneva, Switzerland, Lufthansa Technik is showing its design study of a Fireless Fireplace for VIP & Executive Jets for the first time. The design of the Fireless Fireplace can be adapted to each customer's taste. Many private customers wish to have an interior in the aircraft which is as cozy their living room at home. Until now, an open fireplace has been one of the "no-go's" on board an aircraft, due to safety regulations. Meeting the certification requirements from the authorities, Lufthansa Technik's new Fireless Fireplace looks and sounds like a real fireplace and gives passengers a warm feeling while traveling at cruising altitude. The Fireless Fireplace uses a technology which simulates a fire by illuminating water mist combined with an illuminated imitation of burning wood. This creates a very realistic 3-D impression of a real fire, while the "flame" is cold. Heat, sound and the intensity of the flame can be adjusted by a remote control. The Fireless Fireplace weighs around 30 kg excluding the surrounding interior design. Power consumption is up to 1300 W.
The year is 2030 and you are watching the 23rd series finale of Britain’s Got Talent. You get up to make a cup of tea, and a hidden camera checks that your gait isn’t too wobbly. Another sees you put a biscuit on the saucer, and your smartwatch politely scolds you — you have already reached your self-imposed limit this week. You ignore it. As you return from the kitchen, your heartbeat is logged by observing changes in your face colouration, your breathing by the way your chest rises and falls. By the time you sit down, to hear a septuagenarian Cowell apologise that the dog on a tightrope is really a robotic double, your house has reached its own shocking conclusion: you are at risk of a heart attack, and it needs to call for an ambulance. Maybe you should have trusted its view on biscuits after all. This is the vision of scientists at the University of Bristol, who have created an experimental house that observes everything from how a person gets up from a sofa to how their daily habits change — in innovations they believe are not too far from houses around the country. Ian Craddock, who was speaking at The Times Cheltenham Science Festival, said that the idea was to create a house that understood the behaviour of the people living in it, and reacted when there were changes in the residents that could mean they were at risk. So it might, for example, have noticed in the past that a person’s behaviour changed in a particular way before an asthma attack, and it could warn them to have their inhaler to hand. Or perhaps they are at risk of depression and it notices that they are sleeping more fitfully, and it could advise them to exercise. This warning could come in the form of a flashing light on a wearable device that is easily ignored or, depending on your willpower, something harder to disobey. If having a sanctimonious health fascist for a house sounds unappealing, then Professor Craddock is keen to emphasise it would only be as priggish as you wished it to be. And even then you could always go ahead and have that extra biscuit after all. Just don’t say that it didn’t warn you. The concrete jungle could be turning into a wooden forest. After a century in which cities have sprouted towering columns of concrete and steel, a green building revolution has led to plans to build wooden skyscrapers 35 storeys high. One architect has drawn up designs for the world’s tallest timber building, in Paris, at 120 metres. In London, one of the pioneers of the wooden movement is working on a ten-storey project that will provide 121 homes by October. “It is going to change the whole face of construction,” Andrew Waugh, of architects Waugh Thistleton, said. Made, essentially, out of plywood — albeit very thick plywood — the new generation of timber buildings include the dramatic proposal for the 35-storey building in Paris, from the Canadian architect Michael Green. It is part of a competition called Réinventer Paris. Another proposal, for a 34-storey building in Stockholm, has been put together by the architects Berg/CF Møller. Because the panels are pre-fabricated, the construction is much quicker than for a building using concrete. “When they arrive on site, they are craned from the back of a truck, put in place and screwed down with cordless screwdrivers.